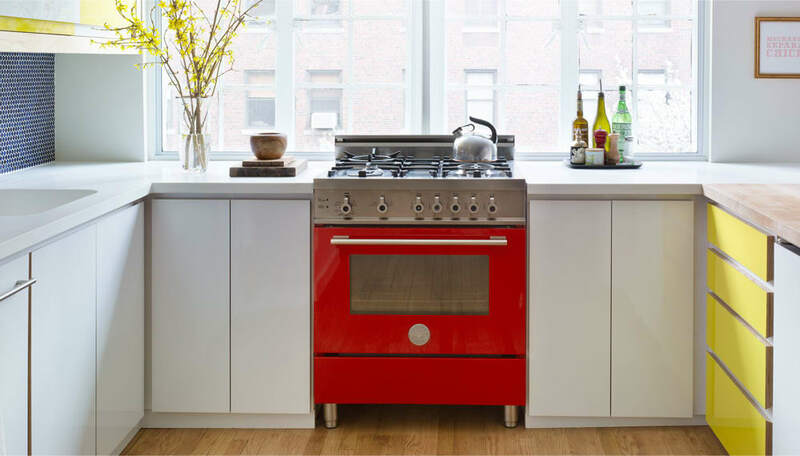 While Bertazzoni Ranges lack the universal name recognition of some run-of-the-mill kitchen appliance manufacturer, the Bertazzoni company has been crafting some of the most beautiful and cost-effective kitchen stoves in the world for more than 100 years. If you’re new to the Bertazzoni name and want to learn a bit more about their approach to range design, here are 5 things to know before buying a Bertazzoni range. For decades, the Bertazzoni name has been associated with an exceptional dedication to high-end range design while consistently keeping their prices an average of 30% lower than other professional-looking ranges. While this approach may lead some manufacturers to cut corners or sacrifice quality, Bertazzoni has found an effective way to offer both high-end style and manageable prices without sacrificing either. Since 2001, Bertazzoni manufacturing began to use what’s known as the ‘Toyata system’ of manufacturing. This revolutionary system allows them to produce products at exceptional speeds and efficiently low costs without compromising quality. As a result, they’ve managed to offer customers without endless budgets a product that’s top-of-the-line in features and appearance. Some of those high-end looks come from the nature of the manufacturing style—25 & 1/8th” depth means that Bertazzoni ranges sit perfectly flush with your existing cabinetry, creating a clean and custom-fitted look instantly. Recently, Bertazzoni ranges received a major update. This was a long overdue overhaul which incorporated a good majority of consumer requests and comments. 2- To Color or Not to Color? Another design feature that sets Bertazzoni ranges apart from the competition is the multiple designer colors options that are available. Rather than using the turn-of-the-century Ford model of “any color you want, as long as it’s black”, Bertazzoni recognizes that each customer is unique, with a unique set of design sensibilities. Bertazzoni offers you the opportunity to select not only the model that suits your functional needs, but also the color that suits your personality. That unique paint job also carries a touch of European flair, using the same triple-coat paint process used on high-end Italian sports cars. Paint finishes on Bertazzoni ranges span the color spectrum, so you’re guaranteed to find a finish that matches your unique style. Bertazzoni ranges come under two series. The Bertazzoni Master Series ranges and Professional Series ranges. As part of their continued effort to offer a wide range (excuse the pun) of options for customers of all types and budgets, each Bertazzoni range comes in both a Basic and a Deluxe edition. Designed to provide even more options for users looking to add Bertazzoni style to their kitchen, this option provides increased flexibility for users based on their budget and needs. Basic Bertazzoni ranges feature aluminum burners, forgoing bonus features like a temperature gauge or storage drawer. The Deluxe versions feature brass burners, which are known to last longer and perform more consistently over time. They also include a glide shelf, built-in temperature gauge and a storage drawer. If you’re struggling to decide whether a Basic or Deluxe version will best suit your needs and budget, consider your cooking needs. Are you a casual cook, who will use your Bertazzoni range for the occasional family dinner or baked treat? Or are you a heavy user, someone who loves being in the kitchen and will get ample use out of bonus features included in the Deluxe editions? Like Bertazzoni products themselves, it’s all about serving your individual and unique needs. It is easy to get confused about different Bertazzoni models in our recent blog post, we prepared an in depth review of which Bertazzoni range to buy. Though it’s a slightly unsung aspect of Bertazzoni’s dedication to customer satisfaction, their two-year parts and labor warranty is quite second to none. For those unfamiliar with the standard warranty practices of range manufacturers, two years is double the one-year standard that’s most common in the industry. By covering parts and labor during this two-year period, Bertazzoni is expressing their confidence in the quality of their products and their dedication to the satisfaction of their customers. It’s more than just knowing that you’ll be covered if something goes wrong—it’s the assuredness of a company confident enough in their product to offer an exhaustive warranty. Bertazzoni has long been known for exclusively manufacturing and selling ranges, but no more—they now sell a full kitchen appliance package that include refrigerators, dishwashers, microwaves, and of course ranges. Not only does this mean that there is a whole new group of appliances featuring the Bertazzoni blend of design and budget-friendly pricing, but it also means that you can now match your entire kitchen with a full suite.